To sum things up, if you know me pretty well ever since college i haven't been on a need to watch too much t.v. but since 2008, there has been one program however that i've made one of my top listings as one of the greater shows to ever come with the advent of reality television. yes, i even wrote a note about it a while back...that show is Americas Best Dance Crew. Three seasons later since my entry, we've come to season 5...and as far as I believe, this has potential to be one of the BEST seasons since the shows airing - true season 1 introduced us to Jabbawockeez and Kaba Modern but since it was just beginning we didn't know what to expect from this show. (Season 2 was one of my personal favorites, and the rest from then have been kinda hit or miss). Season 5 has potential to become one of the best seasons of the show, is because of the unpredictable level of talent with (at least) 5/6 of the remaining crews that made it onto the show. Of course Hawaii is represented (and VERY WELL at that) by the crew of Hype 5-0 comrpised of 7 members from Hypersquad Studio in Waipahu, HI. Of them, my friend Josh (who is the 'leader'/choreographer). I've known Josh since High School and have known him to be someone SO passionate about the art and history of dance so there was no doubt in my mind that he had the talent to make it on the show. He and his crew auditioned since season 3 and almost didn't audition this season but luckily enough they did and made it into the show. 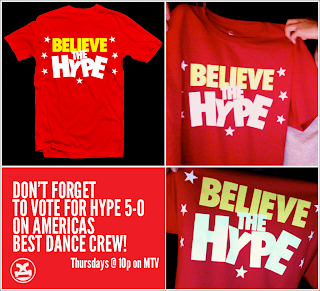 To support/rally Hawaii hopeful i designed a shirt that with their crews motto - "Believe the Hype". These shirts are actually an effort for me to raise funds to pay for my trip so I can support my friend and his crew because I believe in them, and Hawaii really should get on it because I don't think they understand how important it is to these folks. I figured that this is the blog I have where I talk about everything in my design life, so I just thought i'd add a little diddy there. If there's any interest in these shirts, feel free to shoot me an email...or comment on this entry.